Canadian organizers of the Occupy movement ramp up efforts to rally "against spiritual wickedness in high places" during a global day of action Saturday that has the backing of at least a couple of major unions, and has put police on alert. Canadian organizers of the so-called Occupy movement are ramping up efforts to rally "against spiritual wickedness in high places" during a global day of action Saturday that now has the backing of at least a couple of major unions, and has put police and businesses on alert. Thousands in at least 15 Canadian cities — from Vancouver to St. John's — were holding meetings Friday to complete plans for the weekend marches, sit-ins and other efforts to decry what the movement says is an uneven distribution of wealth caused by government policies favouring big business. While locations for where the rallies start and end vary according to city, they generally include marching to financial districts, city halls or other important economic venues. Weather forecasts of heavy rain and high winds in parts of Canada aren't deterring the plans. Their efforts now have the backing of at least two major unions — the Canadian Auto Workers and the Communications, Energy and Paperworkers Union of Canada. "I'm encouraged to see citizens rightfully stand up and take action against what are gross injustices in our economic and social structures," said CAW national president Ken Lewenza in a release Friday. "It's time for people to take ownership of their streets, their economy and fight back against corporations and governments championing right-wing, neo-liberal policies that support a select few, at the expense of the majority." As of Friday evening, Occupy Canada's Facebook page had more than 13,000 "likes" and more than 21,000 "talking about this" hits. A YouTube video shot in Toronto's downtown Dundas Square features someone with Occupy Canada preaching to Canadians to join rallies in their cities as part of a rising "global consciousness." "We wrestle not against flesh or blood, not against Muslim, not against Christian, not against black, not against white – but against powers, against spiritual wickedness in high places, against the rulers of darkness of this world, and that is the truth – and we wrestle not against each other but ... against the corrupt powers of this world," the man shouts. It's all part of the social networking-driven movement, which has been heating up on the front lines in U.S. cities, including in New York where the whole Occupy mission began Sept. 17. Is the Occupy Wall Street message relevant in Canada? Read more. While the U.S. movement has the support of many labour, political and spiritual leaders, Canada's Occupy movement has been criticized for not being focused — which is reflected in a CBC online survey asking Canadians: "Is the Occupy Wall Street message relevant in Canada?" In the U.S., hundreds have been arrested during clashes in various U.S. cities. Despite that, some 1,500 cities globally are taking part in Saturday's day of action. 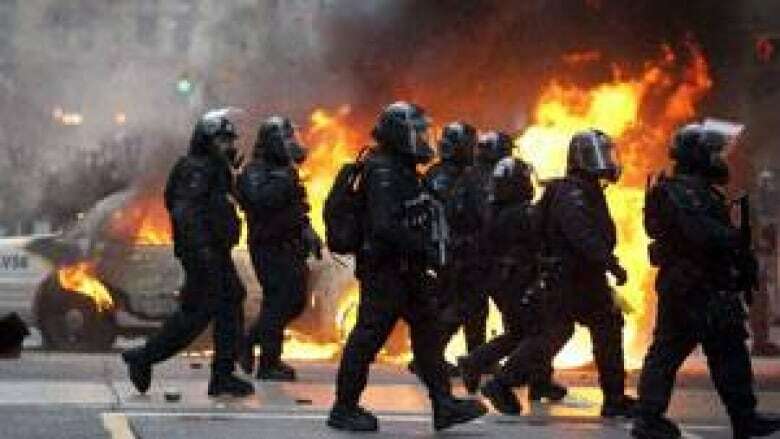 Canadian police units, notably in Toronto and Vancouver where the G20 protests in June 2010 and hockey riots this past June, respectively, have led to violence and arrests, have for days been planning their strategies for handling the Occupy protests. Police officials have been as tight-lipped about how they'll handle Saturday's mass events as the Occupy Canada organizers, who keep a low profile and let their Facebook, Twitter and other social networking efforts drive their planning. However, Toronto police spokeswoman Const. Wendy Drummond reiterated Friday to CBC News that "we do have planning in place to facilitate a peaceful protest and ensure everyone’s safety." Drummond said that for "operational" reasons, she couldn't give details of where police will concentrate their efforts, but added that officers will "be placed in accordance to where the protesters are." When asked if Toronto police have had discussions with downtown businesses — many of which suffered severe losses during G20 looting and vandalism — Drummond said: "With the things that happened in Toronto, obviously we communicate with our partners. Toronto has dealt with protests in the past and those are the policies and plannings we go with, and really it will be the same" for the Occupy Toronto event Saturday. In Vancouver, where the riots following the Canucks' Stanley Cup defeat last June led to dozens of arrests and financial losses estimated at more than $4 million due to vandalism, theft and damage to property, the police service has said it has had "preliminary discussions" with organizers of Saturday's rally that will start at the Vancouver Art Gallery. "We have already engaged in dialogue with self-identified organizers and we expect that we will communicate further with them in the coming days," Const. Jana McGuinness said in a release. "Legal protests and demonstrations in Vancouver are welcome, and people are free to gather in any public space as long as their actions are legal." A call to McGuinness on Friday for an update on police plans wasn't immediately returned. The Occupy Wall Street movement grew out of an idea last summer by the Vancouver-based non-profit group the Adbusters Media Foundation, which was inspired by protests that toppled governments in the Middle East. Occupy Wall Street protesters argue government bailouts in 2008 left banks enjoying huge profits, amid high unemployment and job insecurity, and that the richest one per cent of Americans have huge fortunes and are taxed at a lower rate than the average person. Movement leaders have developed some concrete demands, including that U.S. President Barack Obama ordain a presidential commission "tasked with ending the influence money has over our representatives in Washington." In Canada, however, one commenter known as Buchoman said: "Prior to becoming relevant, the 'protesters' will need to figure out what their cause (and proposed solution) might be. I've heard rants to the tune of "Ban The Federal Reserve", "Cancel All Debt", "Abolish All Business Dealings," (and so forth). However until the protester leaders (whoever they might be) come up with a unified (and coherent) message, this so-called 'Occupy Canada' movement leaves 99% of Canadians scratching their heads." Another commenter, known as ptwonline, begs to differ: "Relevant to Canada? Of course it is. We're seeing some of the same things happen where corporate interests are being put ahead of the people. The Oil Sands is a high-profile example of that, and the general inaction on climate change is long-running example." Prime Minister Stephen Harper, in Peterborough, Ont., for a private meeting with Ontario Premier Dalton McGuinty on Friday, said during a question-and-answer session that he would limit his comments to saying Canada's situation differs from the U.S. concerns. "Canadians understand that Canada has performed very well during the global economic recession," he said. "We've managed to create more growth and more jobs than just about any other industrialized country. We are extremely focused on the needs of Canadians and the needs of the middle class. We obviously have a very different situation here — we didn't bail out our banking sector. Our banking sector was the strongest in the world." Some of the very institutions targeted by Occupy interests in Canada also say they're unclear about the Occupy movement's concerns. "We are not sure what to expect in Toronto and not sure what their demands are," Maura Drew-Lytle, a spokeswoman for the Canadian Bankers Association, said in an interview Friday. "We feel they have a right to protest but we hope it is just done peacefully," she added. "Our banks throughout the economic crisis were strong and stable, and none needed a bailout and customers’ deposits were safe. It’s a very different situation here than it is in the U.S. for sure." However, Drew-Lytle added that Canadian banks "listen very closely to their customers, and whatever concerns they might have ... and if there are any systemic concerns they hear, they’ll make changes." Tom Caldwell, chairman and CEO of Caldwell Securities Ltd., which has offices in Toronto and New York City, also isn't exactly sure about the Occupy movement's goals. "The medium is the protest but what is the message?" he said. Caldwell said Canada "is relatively stable, the banking issues have not been the same and really there is an underlying sense that people are expressing their unhappiness at reaching the end of the age of entitlement." In the U.S., however, there is genuine anxiety, mistrust and fear, he added. While not unsympathetic to the needs of people who have genuinely suffered economic hardship, he said he isn't concerned that his business sector is a target of Occupy protesters. "People forget awfully easily when something else comes along." SURVEY: Is the Occupy Wall Street message relevant in Canada?